The College Counseling team provides guidance and offers information to students beginning in grade 9. 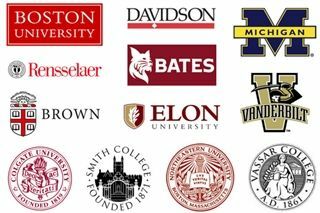 All Upper School students and families are invited to all college counseling events to help them plan for the college application process. The College Counseling team offers information sessions on topics including standardized testing, NCAA eligibility requirements, the college application process, and other important areas in the college counseling process. Brimmer hosts a panel of college admissions officers each fall to share information and insights about their respective institutions and the college search process in general. Practice for standardized testing begins with the PSAT®, which is given to students in both grades 10 and 11. In partnership with the Summit Educational Group, Brimmer offers classes to prepare students for the SAT® and the ACT in the fall and in the spring. In addition, Summit offers evening seminars for parents and students on the testing program. In late January, 11th graders and their parents have a separate evening with the College Counseling team to carefully review college search procedures, testing information, and the college application process calendar for the coming year. Parents of 11th graders have individual appointments with the College Counseling team during the second semester. Students are also enrolled in a weekly College Counseling class to introduce the college application process. There is an emphasis on the use of Naviance, completion of the Common Application, creation of a balanced college list, brainstorm and write the college essay, among other tasks. Students in 12th grade participate in a College Counseling class once a week during the first semester. Students address topics and procedures related to the college application process, including the transition to college, and they complete work on their applications and essays. In the spring of 12th grade, a weeklong program takes place in which outside speakers are invited to address topics designed to help students with the transition to college. Topics offered in the past were: Campus Life, Reflections and Advice from Young Alumni, Resume Writing and Interviewing Do’s and Don’ts, Personal Finances, and Technology Information. Throughout the year, Brimmer welcomes a number of admissions professionals to campus. In addition, the College Counseling team travels to numerous college campuses and attends professional conferences throughout the United States and abroad. As the principal advocate for each Brimmer student in the admissions process, the College Counseling team gets to know each student well through individual meetings and in the classroom. A native of the Jersey Shore, Cindy has worked as a tour guide at Wheaton College where she was a student and upon graduation was offered a job in the admissions department. She worked for eight years in college admissions at Wheaton and Georgetown University, while also consulting for several area independent schools. In addition to serving as the Director of College Counseling, Cindy teaches classes in College Counseling to Grade 11 and 12 students. She travels throughout the U.S. and abroad, visiting colleges and universities and attending professional conferences and seminars. Cindy loves the diversity of students in the Upper School because she feels she can impact the lives of some of Brimmer’s first-generation students. She is also grateful for the opportunities Brimmer provides her to keep up with the massive changes in college admissions. Most of all, she enjoys the close friendships with her colleagues and how much they support each other. Cindy is a member of the National Association of College Admissions Counseling (NACAC), the College Board, Boston Independent School College Counseling Association (BISCCA), and the Association of College Counselors in Independent Schools (ACCIS). Outside of work, she pursues multiple volunteer endeavors through her church, the B-Safe Program at Epiphany School, and through mentoring a first-generation student at Mass Bay Community College. She also loves to read, spend time at the beach, and be with her children and grandchildren. Originally a native of Maine, Anya attended Bates College, where she was a Division III track and field athlete and high jump record holder up until 2012. After graduating from Bates, she lived in New York City, where she worked in children’s book publishing before moving back to Mass. for graduate school. After receiving her M.F.A. in Creative Writing, she worked in college admissions at Bentley University and Emmanuel College before moving to the other side of the desk­­—college counseling. As the Associate Director of College Counseling/Director of Career Readiness since 2017, Anya guides juniors and seniors through their individual college and career discovery processes in a motivating and low stress environment. One of her favorite parts of the college process is helping students brainstorm and develop their college essays. She also enjoys being a resource for students who are hoping to play a sport in college. Anya enjoys Brimmer’s welcoming sense of community among faculty, staff, and students. Anya serves on the Advisory Committee for the Early Education Department at Newton North High School. She is also a member of the National Association for College Admissions Counseling (NACAC), the College Board, and the Boston Independent School College Counseling Association (BISCCA). Outside of work, Anya enjoys writing children's stories, yoga, running, hiking, reading, watching a good TV series, baking, going on adventures with her family, and trying new restaurants. University of Rochester - B.A. As an educator, Joseph seeks to inspire intellectual curiosity, help students develop critical thinking and analytical skills, promote “unanxious expectation,” meet the student where he or she is, and support and challenge them to progress. Joseph has been an independent school educator in a variety of roles for over 29 years. A member of the Brimmer community since 1998, Joseph served as Head of the Middle School and Upper School before becoming the Assistant Head of Academic Affairs. His extensive world travels have provided him with a global perspective and understanding that he uses to oversee Brimmer’s Global Studies Program and teach Introduction to International Relations, an Upper School course. Joseph enjoys working at Brimmer because it is a vibrant learning community with a dedicated faculty and motivated students. He values his interactions with students and colleagues, as well as the opportunity to teach international relations and coach baseball. Joseph is a member of the National Association of Independent Schools and the Massachusetts Baseball Coaches Association. He has taken government courses at the Harvard Extension School as well as participated in a National Endowment for Humanities Symposium for Teachers and the JFK Library Summer Institute for Teachers. Joseph’s interests include bicycling, world politics, movies, baseball, travel, spending time with family, reading, and writing. In his spare time, he serves on the Waltham Public Library Board of Trustees and has coached community baseball and basketball teams for over 15 years. In 2014, Joseph was honored with the Jane Falk Award for Distinguished Volunteer Service. He is a former volunteer with the Massachusetts Association for the Blind and former member of the board for North Waltham Baseball, the Newton Athletic Association, and Friends of the Waltham Public Library.